In recent years, one of the most exciting developments on the Japanese cuisine scene here in LA has been Shunji, the eponymous eatery from former Asanebo toque Shunji Nakao. The restaurant opened in February of last year, and since then, has developed quite a following, with diners and critics alike praising the Chef's complex, refined, omakase-style tasting menus, with a particular nod toward his facility with vegetables. The place is far more than your everyday sushi bar. About the Chef: The Yokohama native began his culinary training in Japan during his teenage years, but moved to the United States in 1984. Here, he and his brother Tetsuya met none other than Nobu Matsuhisa, and the trio worked together for a number of years before they launched the original Matsuhisa in 1987. 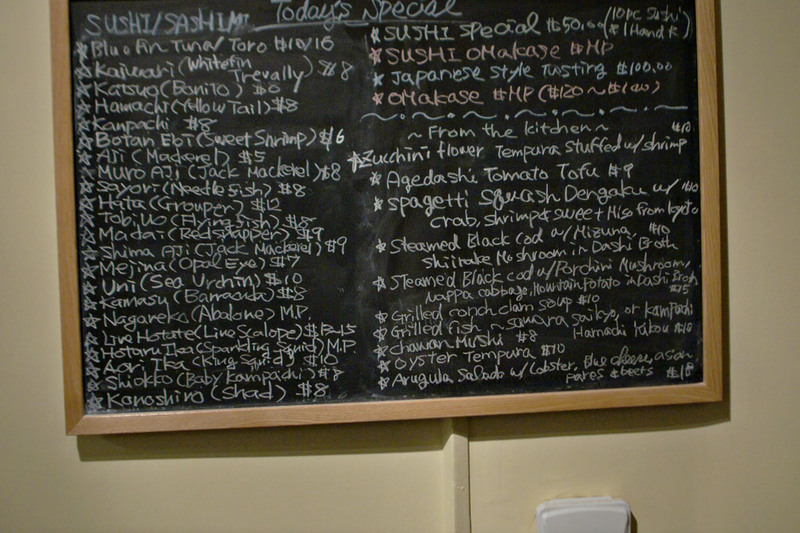 With Nobu's training under their belt, the Nakao brothers opened their own spot, Asanebo ("late riser"), in 1991. The kappo ryori-style eatery was slow to start, but eventually became one of the most widely lauded Japanese restaurants in LA. Shunji-san, however, left the spot in July 2000 to head up the kitchen at The Hump in Santa Monica, and would eventually relinquish his share in the venture. Interestingly enough, while cooking at there, he worked with Kiyoshiro Yamamoto, who's now at the superb Yamakase. Shunji-san left The Hump after several years, and his next stop was Tengu, an offshoot of the Westwood original that opened in January 2007. The restaurant never really caught on though, and after an ownership change, the place finally closed in December 2008. Following the shutter, Shunji-san returned to Japan and opened a place in Tokyo. 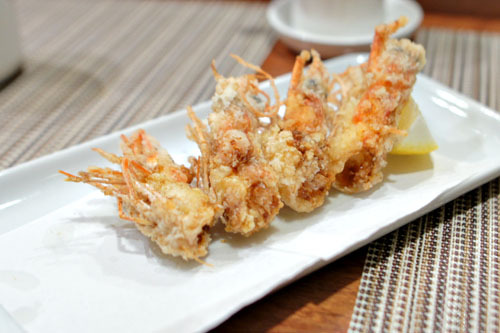 After a couple of years, he moved back to Los Angeles, this time debuting Shunji's on Melrose in January 2011. The more mainstream restaurant got off to a rocky start, and by July that year, the Chef had already split with his partner Cecil Hsu. 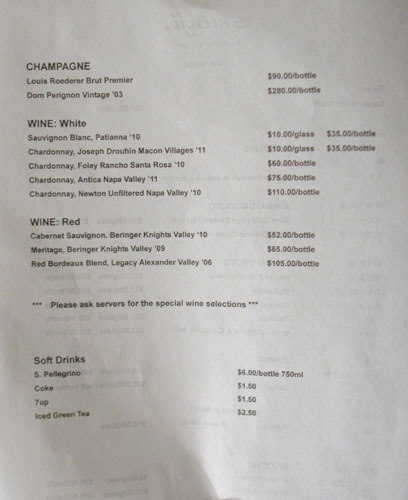 The spot was renamed 7015 Sushi & Sake Bar, and continued to operate until just recently. Orphaned again, Shunji-san quickly snatched up the building that was occupied by Mr. Cecil's, a BBQ joint that closed that December. The self-titled Shunji Japanese Cuisine soft opened on February 23rd, 2012, and grand opened a week later on the 1st of March. Since then, the restaurant has garnered its share of praise, including being named one of the top 10 new sushi restaurants in the US by Bon Appetit, as well as one of the top 10 best new restaurants in LA by Los Angeles magazine. The building that Shunji resides in started life in the Great Depression. Named Chili Bowl, it was, unsurprisingly, a chili-centric eatery actually modeled after its namesake dish, just one location of a mini-chain of restaurants across the Southland that folded in 1947. Afterwards, the building was used for a variety of purposes, including a bar and a Mexican restaurant called Pancho's, before becoming an outpost of Mr. Cecil's California Ribs in 2000. The restaurant, however, suffered a fire at the end of 2011, forcing its shutter before being transformed into Shunji. These days, you'll find seven tables in the circular part of the structure, while an eight-seater bar is off to one side. An interesting note: the bathrooms are outside and require the use of a key, just like my local Del Taco. 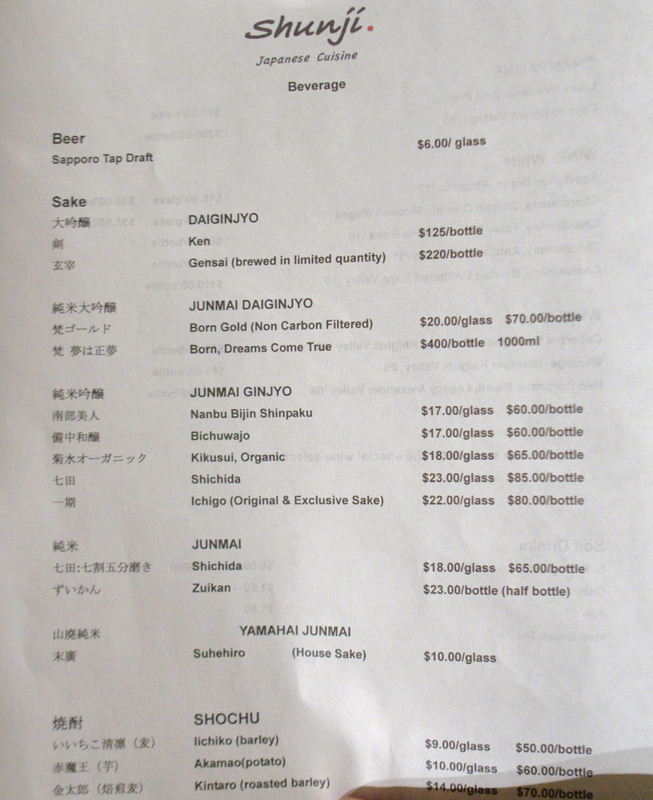 This menu at Shunji is a thing of consternation; I'm not sure about it, even after eating here. As far as I can tell, there's a fixed Sushi Special set at $50, plus a market-priced sushi omakase around $90, then a non-sushi Japanese Style Tasting at $100, and finally an omakase (with both sushi/sashimi and composed dishes) starting at $120. We requested an extended omakase, at a quoted price of $160pp, but ended up paying $200 a head given all the supplemental courses we tacked on. 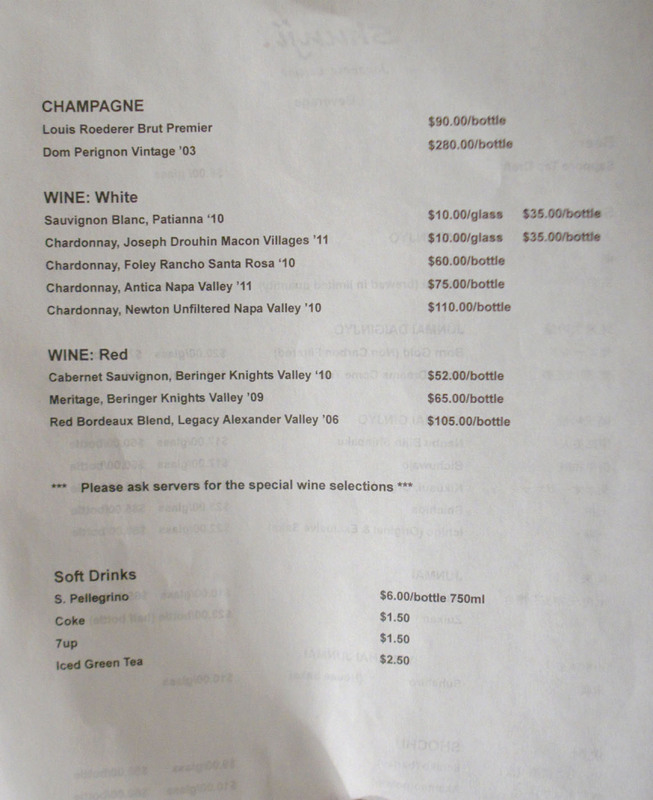 À la carte ordering is also possible, though I'd stick to the items listed on the chalkboard. Click for a larger version. 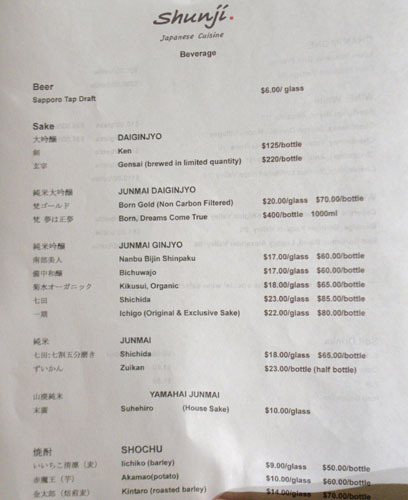 To drink, you'll find a sake list befitting the food, as well as a small selection of wines. Click for larger versions. Baby sea eel reminded me a bit of squid, with its tender, yet somewhat snappy texture and subtle brine, balanced by the vinegar-y tartness and slight savoriness (one of my dining companions guessed katsuobushi) of the accompanying liquid. 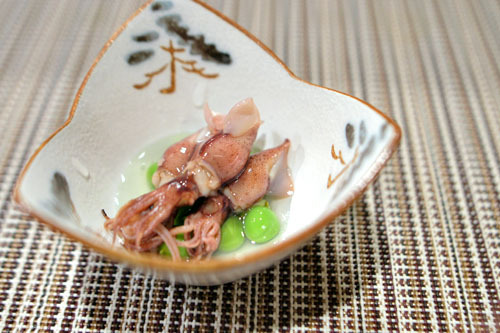 Sparkling squid (hotaru ika) were delightful, with a fantastic consistency and a sweet salinity that contrasted beautifully against the bright, crunchy beans. 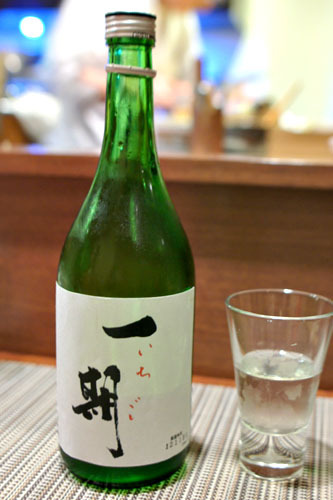 Given the subtlety of Shunji-san's food, sake forms a natural complement, and we went with a bottle of the Ichigo [$80] junmai ginjyo to start. 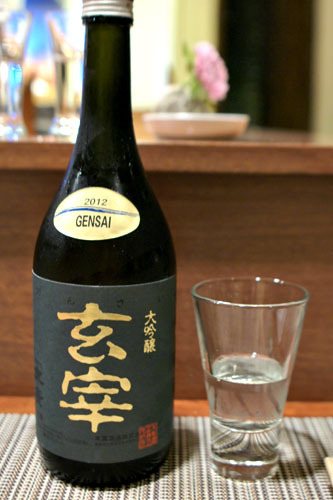 This is actually a sake that the Chef helped brew, and is exclusive to the restaurant. It was a smart pairing to the cooking, medium in body and nicely balanced, aromatic and refreshing, with a good interplay between the rice-y and floral notes present. 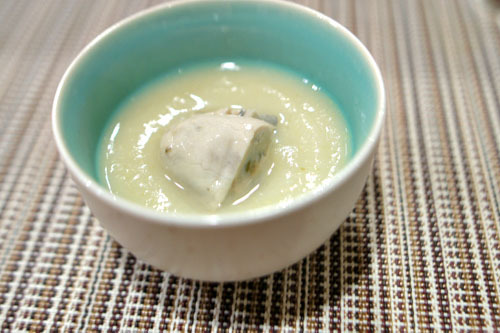 A singular Hama Hama oyster arrived sitting in a potage of potato and napa cabbage. It tasted of the ocean, with an intensity that was subsequently moderated by the gritty, mildly sweet porridge. 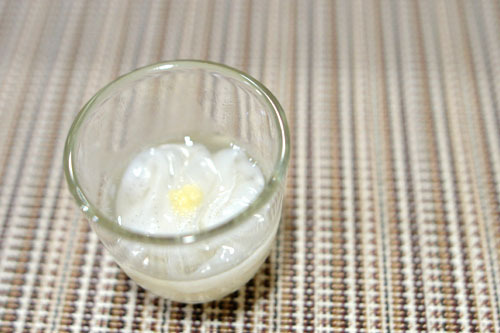 Shirako (fish milt) was made into a rough tofu form, its fine-spun salinity balanced by the depth and piquancy of the ponzu jelly "iris." 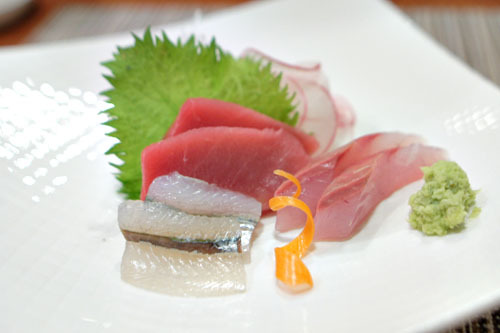 A straightforward sashimi course brought us three varieties of fish. The first was needlefish, a firm specimen conveying a marked brininess that paired swimmingly with a dab of that freshly-grated wasabi. 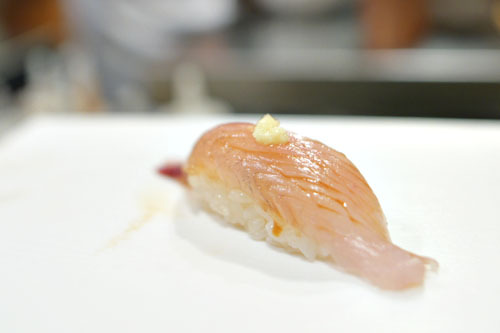 The shiokko (baby kanpachi), meanwhile, was delicate and firm, with a fishy intensity that was brought out by the application of soy. Last up was the bluefin tuna, soft, sticky, and full-flavored--tasty alone and even better with the various accompaniments. 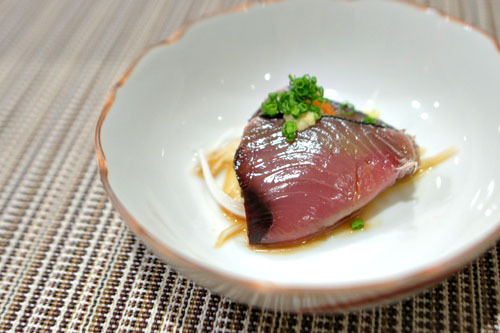 Beautiful slices of dark-toned katsuo came to us paired with ginger, onion, and ponzu. It was a lovely combination, with the zestiness of the ginger moderating the fish in stellar fashion, all while the onion added a fantastic crunchiness to the dish. 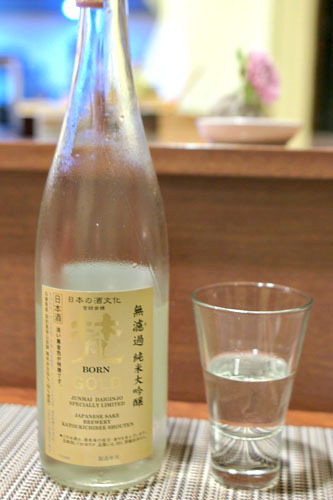 Our second sake was the Born Gold [$70], an aged junmai daiginjyo from Fukui Prefecture's Katoukichibee Shouten. It was quite to our liking as well, with a soft, sweet viscosity and multifaceted complexity to it that made this one an easy drinker. 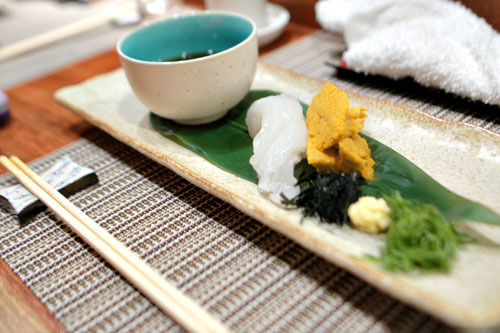 Shunji-san took a departure from Japan with this next course. The excursion was largely a success, with the lobster arriving fresh and true-to-form, albeit a touch chewy. 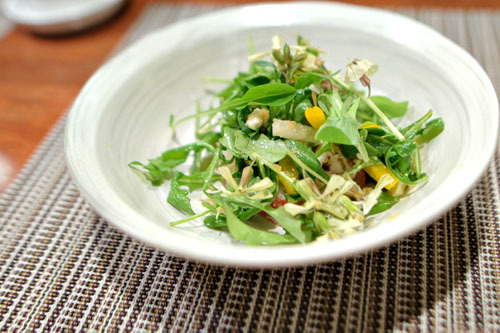 The crustacean's sweetness was masterfully played against the bright, bitter arugula flowers, while the blue cheese added a fantastic integrating element to the dish. Five little bites assembled on one plate comprised our next course. Moving right to left, we began with a globule of monkfish liver, probably the closest thing to foie gras we can get these days. It was a great presentation of ankimo, with its mild, earthy, ocean-y nuances melding superbly with the salty hit of caviar. A ball of potato and blue cheese came topped with persimmon, and was an interesting experiment, with the restraint of the potato gradually leading to the intensity of the cheese on the close. Third was an amalgam of shiitake and okara tofu, wrapped in prosciutto, its airy, delicate savoriness set off by the saltiness of the ham. 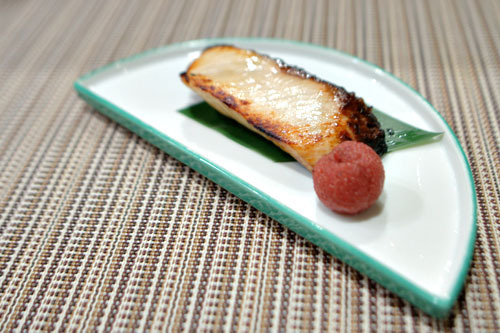 A skewer of ginkgo nut and crab was about what you'd expect, a fitting prelude to the star of the show here, Shunji-san's oft-lauded dish of pitch black squid. 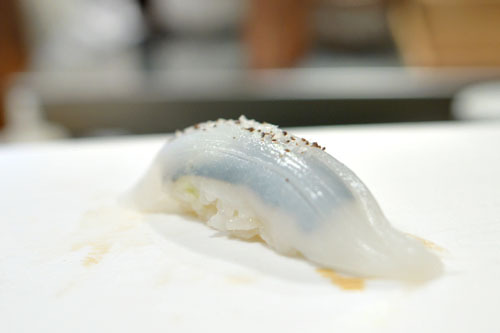 It's basically shredded raw ika dyed with its own ink, truffle, uni, and raw quail egg. We were instructed to eat the squid by itself first, and thoroughly enjoyed the supple juliennes of the cephalopod, its quintessence merging gorgeously with the heady notes of truffle present. Break the yolk, and you get an additional layer of luxuriousness and lightness that seemed to integrate the dish further. 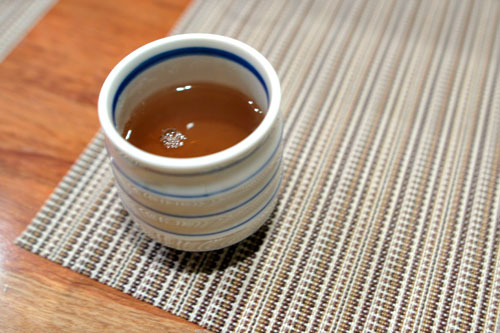 It's bamboo season, and Shunji-san was quick to show off the ingredient in this course. 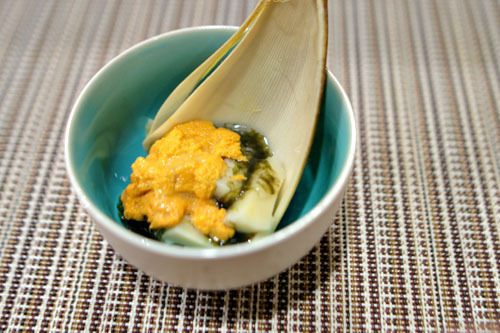 The bamboo was uncommonly crunchy, with a light, vegetal taste that was contrasted against the creamy, rich depth of the seaweed and uni combo. Time for more sake, this time the limited edition Gensai [$220], a daiginjyo from Suehiro Sake Brewery in Fukushima Prefecture. This one was yet another winner, though perhaps a bit more serious than the preceding two sakes, with a fruity character set against the slightest whispers of dry alcoholic heat. 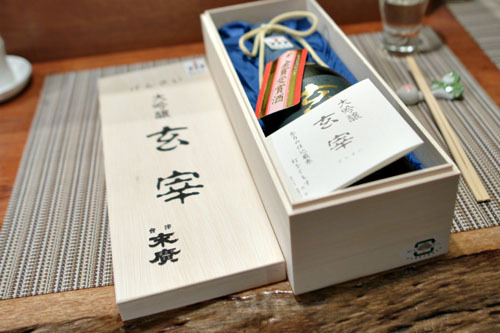 I loved the sake's fancy wooden presentation box as well, which one of my dining companions took home. 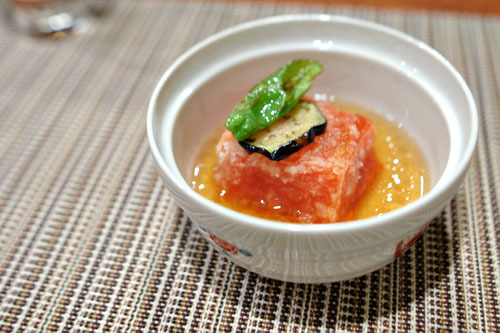 We were then treated to the Chef's signature dish, his so-called "tomato tofu" that he invented during his Tokyo tenure. It's not tofu at all, but rather the innards of tomato, compressed and solidified with kuzuko and lightly fried. The texture really was something special, actually recalling tofu, while the flavor was sweet and tangy, dutifully offset by the dashi-based broth and the heat of the shishito pepper. 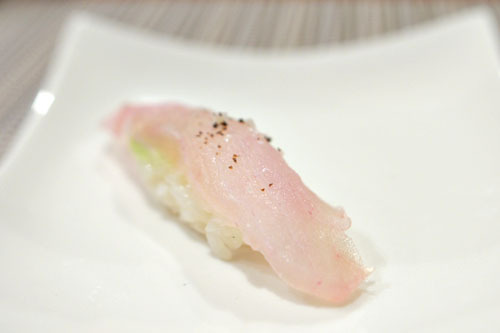 Hamachi was marinated in yuzu and soy, then simply grilled, its firm flesh showing off a good amount of fat and flavor that was nicely set off by the bitter char. To balance out the gravity of the dish, the Chef included a yamamomo, or mountain peach, which provide a sweet, tart counterpoint in the course. 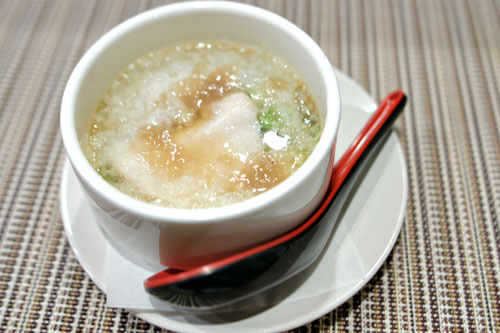 The last course before the gauntlet of sushi was a hot and hearty soup featuring black cod. The fish itself was slick and supple, with a lushness that melded well with the heady depth of the broth. Grated yamaimo added an interesting textural element to the dish, but the crux here was the hakusai cabbage, which lent a profound lightness and crunch that managed to temper the otherwise intense flavors at play. 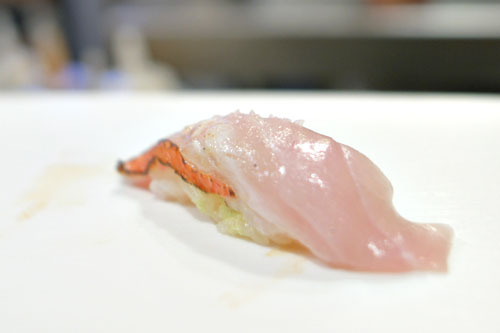 Our first item of sushi brought us red grouper that had been treated with kelp through the kobujime process. The result was a drier, meatier texture on the fish, with a more concentrated, umami-laced taste that paired gorgeously here with the heat of wasabi and a hint of pepper. 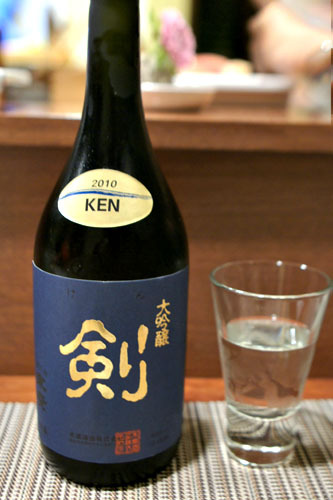 The final sake of the evening was the Ken [$125], a daiginjyo that happens to be the little brother of the Gensai above. I'm not surprised that it came from the same family tree, as this one also displayed a delicious melon-y character, with a touch more rice (probably due to the higher seimaibuai) and a refreshing crispness on the close. Grouper was another rare treat: clean, slick, and eminently balanced, with a great finish. 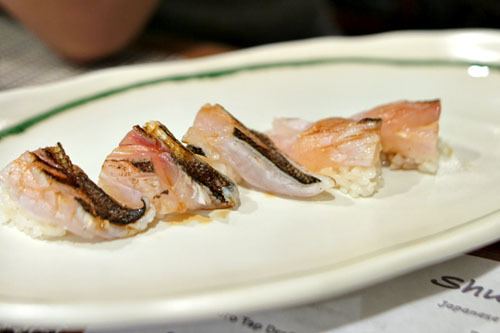 Mackerel was firm and crunchy, with a surprisingly restrained fishiness that was deftly offset by a brushing of soy. 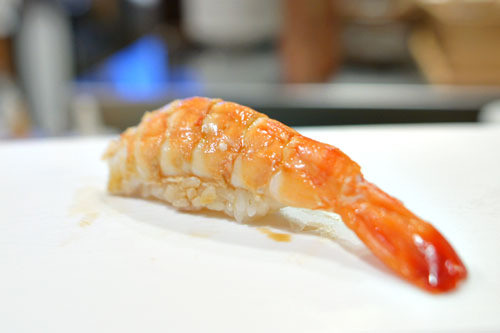 Out came white shrimp, which I'd only had previously at Urasawa. The mass of tiny crustaceans was salty and soft, breaking apart upon mastication. 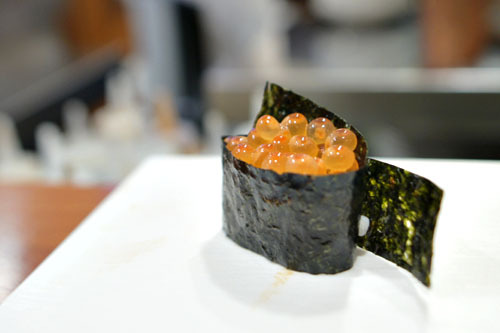 I'm usually not terribly keen on salmon roe, but the version here was one of the best I've had. 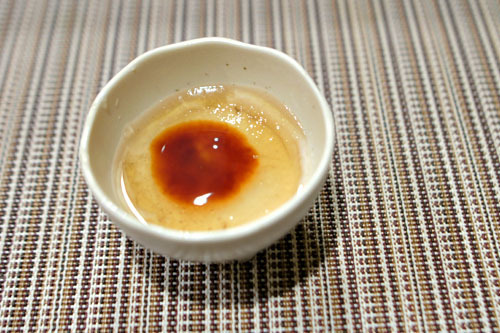 Marinated with dashi, the globules were cool and briny, with a lovely pop to 'em and a great counterweight in the form of the sushi's seaweed wrapper. 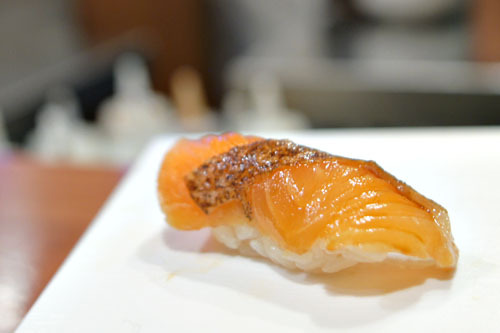 Flying fish is oft used for its roe, which is known as tobiko. 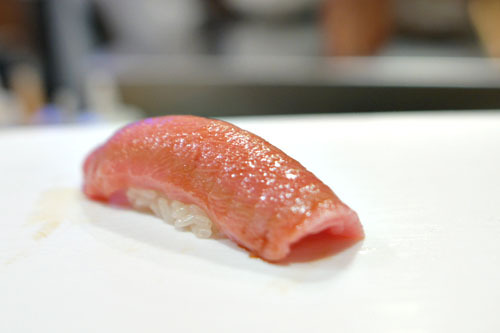 Its meat is far less common, which is unfortunate, as it makes for a lovely sushi fish, with a refreshing character emphasized by the use of yuzu and wasabi. 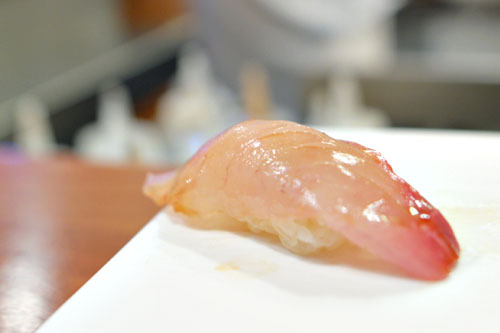 The kanpachi was a prototypical example of the varietal, mild tasting and firm, with its flavor brought out with a dab of soy. The kinmedai was one of my favorites here given its light sear, which imparted a fantastic smoky character to the fish. 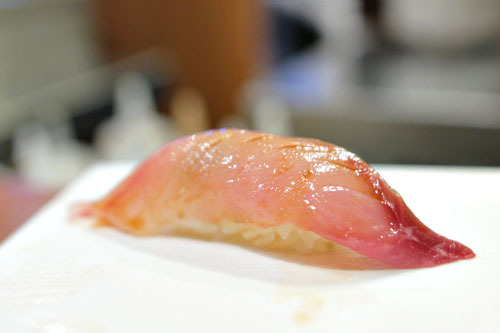 Toro was fatty and oily, though not ridiculously so, with a melty consistency and a rich, satisfying taste. Shrimp was sourced from Papua New Guinea of all places. When it comes to sushi, I'm usually more of a fan of raw shrimp, but this was about as good as it gets for a cooked preparation. 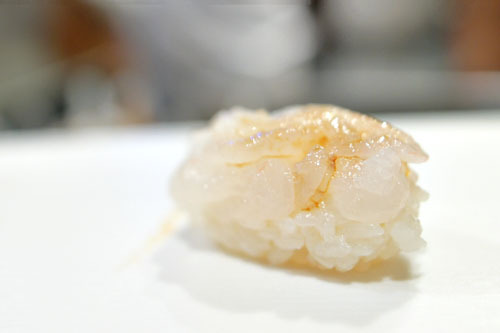 Great texture on this one, with the essence of the botan ebi nicely preserved. Barracuda was another highlight of the sushi portion of the meal, with a slight sweetness that paired wonderfully with the charring on the fish. 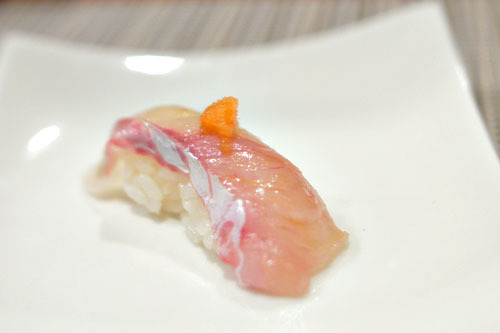 Unfortunately, there was only enough for three portions, so each piece of nigiri had to be cut in half. Some in my party were clamoring for uni, so Shunji-san obliged with these Santa Barbara specimens: creamy, cool, and tasting of the ocean, though slightly bitter, with a great counterpoint from the nori. The kaiwari was a first for me, but hopefully not a last. It was a standout for its texture, which was firm, crunchy, and slightly chewy, with an almost engawa-esque bite to it. Salmon was quite lovely, with a delightful savoriness to it amped up by the saltiness of the crisp strip of skin still attached. Nice citrus kick on this one, too. The heads from the shrimp above were deep fried and brought out to the bar. They were fantastic, as good as any preparation I've had. Abalone was also satisfying, as we really got to enjoy its texture. I much appreciated the band of seaweed here, which added a nice accent point to the course. Squid was sticky and palate coating, with a restrained taste that formed a fitting base on which the salt and pepper could shine. At this point, one of my dining companions asked if Shunji-san could prepare a dish of ika somen, and this was the result. Sadly, I didn't actually manage to grab a bite. 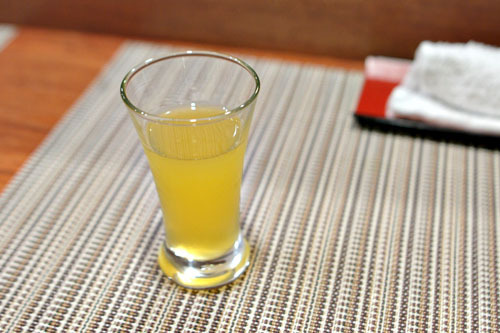 Serving as an intermezzo was a sweet shot of mikan juice. Dessert comprised three different treats. The chocolate mousse was the heaviest of the troika, with a smoothness and creaminess to it that was belied by a strong taste of cocoa powder. 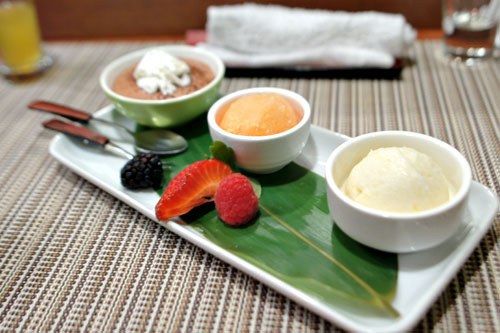 My favorite was the grapefruit sorbet, which conveyed the bracing bitterness of the fruit in commanding fashion. The lemon ice cream, finally, was also successful, with a great balance between sweet and sour elements. Chef Shunji Nakao (right) and his team. I'm proud to report that Shunji has joined the pantheon of Los Angeles Japanese restaurants occupied by the likes of Yamakase, n/naka, and Urasawa. 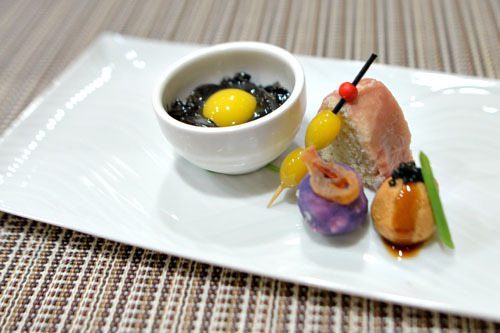 The Chef's composed dishes display refinement and technique, but at the same time a willingness to experiment and venture outside the bounds of tradition. 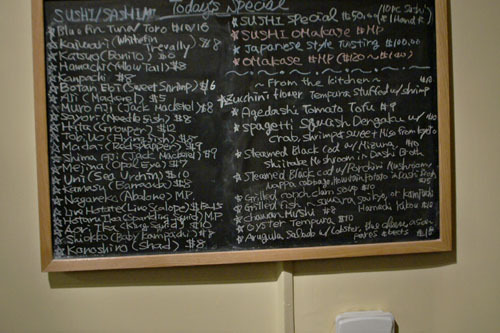 The sushi section of the meal, meanwhile, was also top notch, with a selection of fish that one rarely sees in the Southland. The overall effect is an intimate, memorable experience that is an absolute must-try for fans of Japanese cooking. It seems that, after years of false starts, Shunji-san has finally found himself. Please try jinpachi I really want to knOw what you think of that place. They make the ir own soy sauce and tofu.. its amazing. Its on westborne and Santa Monica. Chris: Me too; it was about damn time. I notice you've been quite a few times as well. sygyzy: Sure, it was basically all the stuff from the shrimp nigiri on. Helen: Ha, thanks for coming out! Anon: Yes, I'm quite aware of Jinpachi, and it's been on my "to-eat" list for a long while now (along with Nishimura). Ila: Small world! So where are you working these days? Amy: No worries. I had plenty of time to try, but for some reason I hesitated. Baby sea eel looks truly amazing, never heard about such a thing. Love your review Kevin! I've been following your blog since 2008. Quick note- "15: Japanese Mackerel/ Aji" I thought Aji was Spanish Mackerel, no? Kevin, like Chris, I was wondering when you'd finally hit this place. Glad you enjoyed it! Tiffany T, aji is often known as Spanish mackerel, but is actually horse mackerel. There are various species of horse mackerel, so maybe the one Kevin had was Japanese horse mackerel as opposed to Atlantic horse mackerel. Supposedly true Japanese Spanish mackerel (wrap your head around that) is called sawara, though I've also heard sawara used for king mackerel. LeGrumeau: Yeah, I think this was my first time having it as well--tre cool! 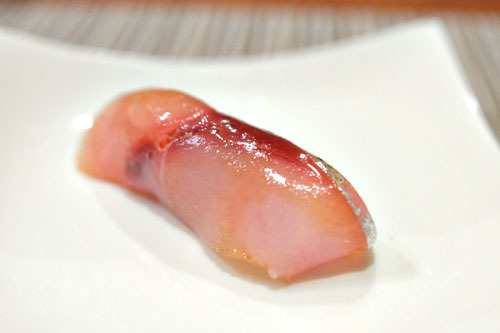 Offalo: Indeed, "aji" is almost identified as Spanish mackerel, though technically it's horse mackerel as you said. I've also experienced the naming confusion with "sawara" as well. I will say that what we had tonight wasn't like you're typical "aji." 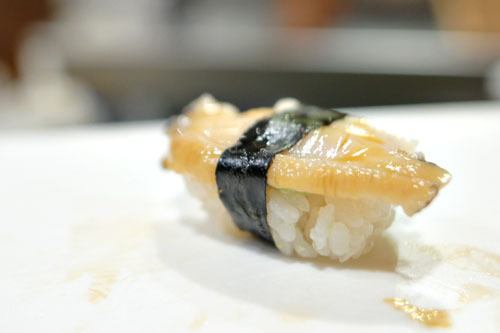 Kevin, your "Japanese mackerel" was probably actually muro aji, jack mackerel or round scad. Had it last week at Shunji, and as you said, different than the typical aji, which has a slight bitterness like iwashi but not quite, closer to a shimaaji. 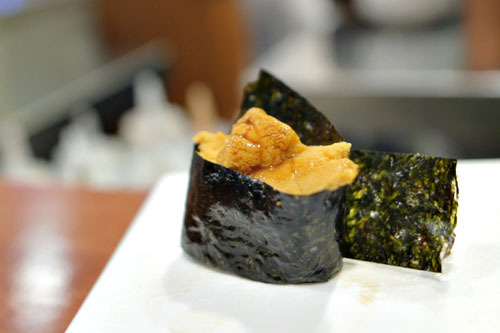 you often promote Uni as being delicious, so I finally found a place that actually had it (I'm in Canada), and I ordered it. You converted me to something I wouldn't ever have ordered. Your blog works in great and mysterious ways. :) I did enjoy it btw!